This last week, our challenge was to have at least 2 fruits or vegetables with every meal. There is only one meal that we didn’t do that, the last meal of the week. We ate at a barbeque restaurant with few options for vegetables. I don’t feel too badly though because we averaged well above two fruits/vegetables per meal over the whole week, including breakfasts! Yay us! We all also had green beans in that final meal of the week. And I think the point of the challenge is to not only include more produce in the diet, but also offer options for someone who might not like one of the offerings. I will call that a success. Speaking of eating out, we did that twice the last day of this challenge. It is the cost of those meals that we are over budget compared to a week’s worth of food stamp benefits. We will try to make up for it in the next few weeks to stay within budget for the month. To see what we purchased and what we ate, check out the Budget page. I will not include this “meal plan” each time unless I hear from others they would like to see it. You will see some items on the list that don’t count as “real food”. For example, mayonnaise, chocolate milk, store bought ice cream. Nearly all of it though follows the guidelines. Some of those will disappear over these weeks of challenges. OK, on to the next challenge. This week, we are to drink only water, milk, coffee or tea, without any sugar (sweetened with honey or maple syrup is ok). One glass of juice in the week and red wine in moderation is also ok. Because our family doesn’t drink wine, I think one additional cup of purple grape juice is allowable. We mostly drink water and like milk and tea as well. My husband likes coffee with sugar, but recently switched to maple syrup and likes it fine. 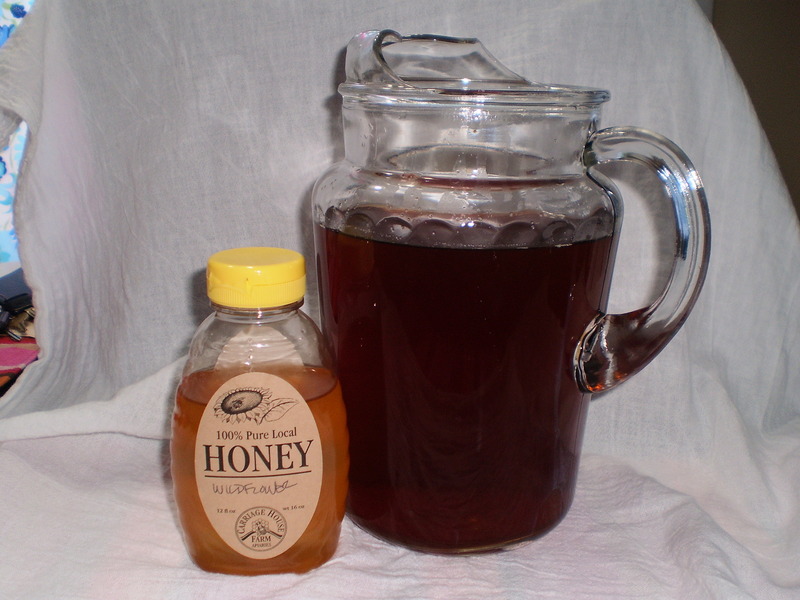 I like honey in my tea (iced or hot) and my oldest daughter doesn’t really like juice much anyhow and only drinks it once in a while. Again, not the toughest week, but there will be a bit of a challenge. I like Izze sparkling juice and usually have about 3/week. My husband also. My youngest loves juice and we already water it down some to limit it. She usually has a few cups a week. We all like hot chocolate (mochas for hubby) and the girls like chocolate milk. So, this week I will try to come up with a delicious chocolate milk/hot chocolate without sugar. Hmmm…..or maybe an alternative. Vanilla milk with honey or plain 100% chocolate with honey or maple syrup in milk..? I’ll let you know what we come up with. Any thoughts out there? This entry was posted in Challenges and tagged beverage, challenge, sugar free by hshaut. Bookmark the permalink.